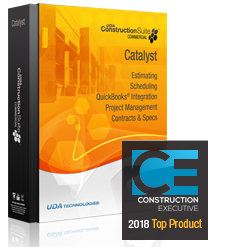 Combining the power of two leading Products, UDA ConstructionSuite CM Catalyst is engineered to be a powerful solution for construction professionals. With robust tools for Estimating, QuickBooks Integration, Scheduling, and Contracts, ConstructionSuite CM Catalyst also delivers the new Items Database, Integrated Calendar, Resource Allocation, Change Order Management, CAD Integration, Insurance Tracking, Workflows, Application for Payment, Lead Tracking, Cash Flow Reporting, and the breakthrough technology of ConstructionNet CRM. Get Started in Minutes - ConstructionSuite is available for immediate download.